World champion Michael Schumacher admits there is no end in sight for Ferrari's lack of competitiveness. "If you look at the lap times we were doing in the race, it doesn't look very good for us," Schumacher said. "We have been moving backwards in the last few races not forwards. We have to admit we are not good enough." Schumacher, who is 34 points behind leader Fernando Alonso in the world championship, said his hopes of defending his title were "getting further away". He said he was looking forward to the next race, his home Grand Prix in Germany, for which Ferrari would have some new aerodynamic parts on their cars. But he added: "I wish I could promise the fans there a bit more than this." 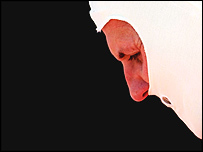 Schumacher said he was "neither happy nor sad" with Ferrari's current state. "I'm calm," he said. "This is just a period that you have to go through. I can live with it." Schumacher said the car did not feel bad to drive but that it was not fast enough. "The handling was not the problem, there was just no grip." Many F1 observers believe Ferrari's problems are caused by their Bridgestone tyres, which are considered to be less competitive than the Michelins used by the other top teams. The car, most believe, is among the best. But Schumacher blamed Ferrari's decision to introduce their new car after the start of the season. Its debut was brought forward to the third Grand Prix, but that led to reliability problems which further hampered the team. "We were a bit late in development at the start of the year and then we had to delay the development of the car because we had reliability issues," Schumacher said. "So there is still a bit lacking in areas where normally that would not be the case." Ferrari technical director Ross Brawn said the team did not yet fully understand why they were so much slower than the pace-setting McLaren and Renault. But he said he believed it was due to a combination of two things. First, he said, McLaren and Renault had been more effective at making the most of the new rules that were introduced this year. These include aerodynamic restrictions and using only one set of tyres for the entire race. And he said Bridgestone's ability to develop its tyres alongside the new rules was being hindered because only Ferrari were able to develop them. Michelin, by contrast, has data from several teams. "There is an element that we are the only prime customer of Bridgestone," Brawn said. "It is a sensitive and controversial subject and people will say, perhaps quite rightly, that that's your own fault. "But when you have such a substantial change in the tyre regulations, there is a steep learning curve and Bridgestone have one partner contributing to the learning curve. "Michelin and their teams have the benefit of a group effort. "We were wrong-footed by the regulations and other teams have done a better job."